According to a legend that appeared in the tenth century, Ursula was the daughter of a Christian king in Britain and was granted a three year postponement of a marriage she did not wish, to a pagan prince. With ten ladies in waiting, each attended by a thousand maidens, she embarked on a voyage across the North sea, sailed up the Rhine to Basle, Switzerland, and then went to Rome. On their way back, they were all massacred by pagan Huns at Cologne in about 451 when Ursula refused to marry their chieftain. According to another legend, Amorica was settled by British colonizers and soldiers after Emporer Magnus Clemens Maximus conquered Britain and Gaul in 383. The ruler of the settlers, Cynan Meiriadog, called on King Dionotus of Cornwall for wives for the settlers, whereupon Dionotus sent his daughter Ursula, who was to marry Cynan, with eleven thousand maidens and sixty thousand common women. Their fleet was shipwrecked and all the women were enslaved or murdered. The legends are pious fictions, but what is true is that one Clematius, a senator, rebuilt a basilica in Cologne that had originally been built, probably at the beginning of the fourth century, to honor a group of virgins who had been martyred at Cologne. They were evidently venerated enough to have had a church built in their honor, but who they were and how many of them there were, are unknown. From these meager facts, the legend of Ursula grew and developed. Feast day October 21. Commemoration of Saint Hilarion, a Palestinian solitary, passed a life of self-denial and mortification in the wildernesses of Egypt and the Holy Land. His biography was written by St. Jerome. His last words were: “Go forth, O my soul, what do you fear? You have served Christ for seventy years, do you now fear death?” In the East he was the first to be venerated as a saint other than a martyr. He died at the age of eighty in 371. I spoke of Thy testimonies before kings, and I was not ashamed : I meditated also on Thy commandments, which I loved. (Ps. 118: 1) Blessed are the undefiled in the way: who walk in the law of the Lord. V.: Glory be to the Father, and to the Son, and to the Holy Ghost. As it was in the beginning, is now, and ever shall be, world without end. Amen. 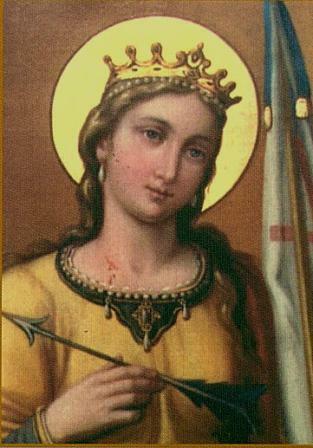 Grant us, we beseech Thee, O Lord, our God, to venerate with unceasing devotion the victories of Thy holy virgins and martyrs, St. Ursula and her Companions, that, though we can not worthily celebrate their merits, we may at least offer them our humble service. Through our Lord Jesus Christ, Thy Son, Who liveth and reigneth with Thee in the unity of the Holy Ghost, one God Forever and ever. O God, Who dost gladden us by the annual feast of blessed Hilarion, Thy confessor, mercifully grant that, as we celebrate his natal day, we may also imitate his actions. Through the same Lord Jesus Christ, Thy Son, Who liveth and reigneth with Thee in the unity of the Holy Ghost, God, Forever and ever. R.Amen. Lesson from the Book of Wisdom. O Lord, my God, Thou hast exalted my dwelling-place upon the earth, and I have prayed for death to pass away. I called upon the Lord, the Father of my Lord, that He would not leave me in the day of my trouble, and in the time of the proud, without help. I will praise Thy name continually, and will praise it with thanksgiving and my prayer was heard, and Thou hast saved me from destruction, and hast delivered me from the evil time. Therefore I will give thanks, and praise Thee, O Lord our God. Harken, O daughter, and see, and incline thine ear; for the King hath greatly desired thy beauty. V. (Ps. 44: 5) With thy comeliness and thy beauty, set out, proceed prosperously, and reign. Alleluia, alleluia. V. (Matth. 25: 4, 6) The five wise virgins took oil in their vessels with the lamps: and at midnight there was a cry made: Behold the bridegroom cometh, go ye forth to meet Christ our Lord. Alleluia. After her shall virgins be brought to the King: her neighbors shall be brought to Thee with gladness and rejoicing: they shall be brought into the temple of the King, the Lord. Favorably look down, We beseech Thee, upon the gifts laid laid upon Thine altars, that, of Thy holy virgins and martyrs, O Lord, for the festival of Thy holy virgins and martyrs, Ursula and and her Companions, that, as Thou hast conferred glory upon them through these blessed mvsteries, so Thou mayest bestow upon us forgiveness. Through Jesus Christ Thy Son our Lord, Who liveth and reigneth with Thee in the unity of the Holy Ghost, one God Forever and ever. R.Amen. We offer Thee, O Lord, sacrifices of praise in commemoration of Thy saints, by whom we trust to be delivered from evils both present and future. Through our Lord Jesus Christ Thy Son our Lord, Who liveth and reigneth with Thee in the unity of the Holy Ghost, one God Forever and ever. Let the proud be ashamed, because they have done unjustly towards me: but I will be employed in Thy commandments and in Thy justifications, that I may not be confounded. For ever and ever. R. Amen.